Laverne & Shirley (originally Laverne DeFazio & Shirley Feeney) is an American television sitcom that played for eight seasons on ABC from January 27, 1976, to May 10, 1983. A spin-off of Happy Days, Laverne & Shirley followed the lives of Laverne DeFazio (Penny Marshall) and Shirley Feeney (Cindy Williams), two friends and roommates who work as bottle-cappers in the fictitious Shotz Brewery in late 1950s Milwaukee, Wisconsin. From the sixth season onwards, the series' setting changed to mid-1960s Burbank, California. Michael McKean and David Lander co-starred as their friends and neighbors Lenny Kosnowski and Andrew "Squiggy" Squiggman, along with Eddie Mekka as Carmine Ragusa, Phil Foster as Laverne's father Frank DeFazio, and Betty Garrett as the girls' landlady Edna Babish. Featuring regular physical comedy, Laverne & Shirley became the most-watched American television program by its third season, and was nominated for two Golden Globe Awards and a Primetime Emmy Award in 1979. The series was a spin-off from Happy Days, as the two lead characters were originally introduced on that series as acquaintances of Fonzie (Henry Winkler). Set in roughly the same time period, the timeline started in approximately 1958, when the series began, through 1967, when the series ended. As with Happy Days, it was made by Paramount Television, created by Garry Marshall (along with Lowell Ganz and Mark Rothman) and executive produced by Garry Marshall, Edward K. Milkis, and Thomas L. Miller from Miller-Boyett Productions. According to Michael Eisner, Cindy Williams had refused to do the Laverne & Shirley spin-off, so her role was recast with Liberty Williams (no relation), and a seven-minute screen test was filmed. Between that afternoon shoot and the evening, Cindy Williams was eventually talked into doing the role and the scene was re-filmed that night with who would become the lead actresses. Executives wanted to see both versions, but Eisner hid the first reel of film in a closet of the building and said at the screening that the film from the first shoot had gotten lost, so they only watched the performance of Cindy Williams with Penny Marshall. At the start of each episode, Laverne and Shirley are skipping down a Milwaukee street, arm in arm, reciting a Yiddish-American hopscotch chant: "1, 2, 3, 4, 5, 6, 7, 8 Schlemiel! Schlimazel! Hasenpfeffer Incorporated," which then leads into the series' theme song, "Making Our Dreams Come True" performed by Cyndi Grecco. The hopscotch chant is from Penny Marshall's childhood. For the first five seasons, from 1976 to 1980, the show was set in Milwaukee (executive producer Thomas L. Miller's home town), taking place from roughly 1958–59 through the early 1960s. Shotz Brewery bottle cappers and best friends, Laverne DeFazio and Shirley Feeney, live in a basement apartment, where they communicate with upstairs neighbors Lenny and Squiggy by screaming up the dumbwaiter shaft connecting their apartments. Also included in the show are Laverne's father, Frank DeFazio, proprietor of the Pizza Bowl, and Edna Babish, the apartment building's landlady, who would later marry Frank. Shirley maintained an off-again on-again romance with dancer/singer/boxer Carmine Ragusa. During this period, characters from Happy Days and Laverne & Shirley would make occasional guest appearances on each other's series. During the fifth season, the girls went into the Army Reserve, and they contended with a tough-as-nails drill sergeant named Alvinia T. Plout (Vicki Lawrence). While their time in the Army Reserve was brief in the live action series it did inspire an animated series with the duo in the army contending with their immediate superior, a commanding pig named Sgt. Squealy who was voiced by Ron Palillo (best known for his role as Arnold Horshack on Welcome Back Kotter) who is always threatening to report them to Sgt. Turnbuckle (voiced by Kenneth Mars). Michael McKean and David Lander created the characters of Lenny and Squiggy while both were theater students at Carnegie Mellon University in Pittsburgh, Pennsylvania. Lander told an interviewer in 2006 that they created the characters while high on marijuana. After graduating, they continued to perform the characters in live comedy routines before joining the show's cast. For the sixth season in 1980, Laverne and Shirley and their friends all moved from Milwaukee to Burbank, California. The ladies took jobs at a department store, Frank and Edna managed a Texas barbecue restaurant called Cowboy Bill's, Carmine delivered singing telegrams and sought work as an actor, and Lenny and Squiggy started a talent agency called Squignowski Talent Agency. From this point until the end of the series' run, Laverne & Shirley was set in the mid-1960s. In one of the shots in the show's new opening sequence, the ladies are seen kissing a 1964 poster of The Beatles. With each season, a new year passed in the timeline of the show, starting with 1965 in the 1980–81 season, and ending in 1967 with Carmine heading off for Broadway, to star in the musical Hair. When the series' setting changed to California, two new characters are added: Sonny St. Jacques, a stunt man, landlord of the Burbank apartment building and love interest for Laverne; as well as Rhonda Lee, the ladies' neighbor and an aspiring actress. In March 1982, Cindy Williams became pregnant with her first child. In May, Williams and her manager-husband Bill Hudson presented a list of demands to accommodate her pregnancy and pending childbirth, which Paramount refused. In August, two episodes into production of the series' eighth season, Williams left the show and filed a $20 million lawsuit against Paramount. The case was later settled out of court and Williams was released from her contract. As for Shirley, she quickly falls in love in the two episodes produced before Williams' departure, and marries Army medic Walter Meany (making her Shirley Feeney Meany). In Williams' final scenes, Shirley discovers that she is pregnant. Shirley's absence is explained with a note left for Laverne saying that she had left town quickly to join her husband overseas. Despite the departure of Williams, ratings held steady and Laverne & Shirley ranked at #25 for the 1982–83 season. ABC asked Penny Marshall to return for a ninth year, but she insisted that the show move its production base from Los Angeles to New York. Eyeing the cost of such an endeavor, and given the age of the show, ABC quietly canceled Laverne & Shirley in May 1983 after 178 episodes. The final episode was produced as a backdoor pilot for a possible spin-off series for Carmine, who was shown moving to New York City to star in the Broadway show Hair; Laverne was only seen at the beginning and end of the episode. However, the spin-off never materialized. Laverne Marie DeFazio (Penny Marshall) is known for being a tough-talking tomboy. She grew up in Brooklyn, with her Italian immigrant parents. Laverne's parents moved to Milwaukee, where her mother died. Laverne works alongside best friend and roommate Shirley. Milk and Pepsi is Laverne's favorite drink. Her trademark is the script letter "L" monogrammed on her shirts and sweaters, an idea Marshall got from seeing a vintage sweater in the wardrobe department with an initial sewn in the upper left corner, something that would help the audience remember that she is Laverne. Shirley Wilhelmina Feeney (Cindy Williams, seasons 1–8) is the perky, positive one. She also tends to be meek, while Laverne is more outspoken. She later becomes a huge fan of teen-idol Fabian. Her overbearing mother Lily (Pat Carroll) expects more from Shirley than she can give. Shirley is sensitive and tends to overreact. When she tries to hold back a laugh, she bites her knuckle on her index finger. Shirley works at Shotz brewery with Laverne. She has a special relationship with her stuffed cat Boo Boo Kitty, a name Williams gave the toy after forgetting a line in rehearsal, and was the name of her mother's cat. Leonard "Lenny" Kosnowski (Michael McKean) is a lovable goof who pesters Laverne and Shirley, along with his best friend and roommate Squiggy, both of whom live upstairs from Laverne and Shirley's lower-level apartment. Lenny works as a truck driver at the Shotz brewery. Lenny says that, while he is not completely sure, he thinks his last name (Kosnowski) is Polish for "Help, there's a hog in my kitchen". Andrew "Squiggy" Squiggman (David Lander) works and lives with childhood friend Lenny. Squiggy makes nearly every entrance with his trademark "Hello" said in a comically dopey voice. In the final season, Squiggy's lookalike sister Squendoline is introduced. Frank DeFazio (Phil Foster) is Laverne's father who runs the Pizza Bowl, a local hang out. He later opens up Cowboy Bills in Burbank, California. Although he could be harsh and lose his temper, he did have a heart of gold. He loves Laverne very much, having been her only parent for years. His pet name for his daughter was "Muffin". Frank is also protective of Shirley, becoming somewhat of a surrogate father to her since her family was far away. Carmine Ragusa (Eddie Mekka) is Shirley's high-school sweetheart and on-again, off-again romance. "The Big Ragoo" is a part-time boxer and former Golden Gloves champion who owns a dance studio and is constantly working to make it big as a dancer and singer. In the final episode of the series, he auditions for the musical Hair, at last landing a major role on Broadway. Edna Babish DeFazio (Betty Garrett, seasons 2–7) is the five-time-divorced landlady who eventually marries Laverne's father. Edna also occasionally sings and dances in the local brewery talent shows. When the series was extended beyond the intended final season, actress Betty Garrett committed to another project and was written out as having left Frank. Rhonda Lee (Leslie Easterbrook, seasons 6–8) is a tall, voluptuous, somewhat ditzy blonde actress/singer/dancer/model trying to get discovered and make it big in Hollywood. She is Laverne and Shirley's neighbor and a regular character after they move to Burbank. Rhonda, who also comes off as rather narcissistic about her good looks and self-obsessed, usually (always?) refers to herself in the third person, by her first name. Rhonda often bursts into Laverne and Shirley's apartment (occasionally at inopportune times, much like Lenny and Squiggy often do) to borrow things without really asking and to brag about her social engagements or romantic dates with desirable men with the intention of making the girls envious. (Big) Rosie Greenbaum (Carole Ita White) is Laverne and Shirley's childhood nemesis. She married a rich doctor and rubs this in the ladies' faces, though they make fun of the fact that he is a proctologist. She is Laverne's rival and upsets her by calling her a "bimbo". Big Rosie and fellow Milwaukee classmate Terri Buttefuco both return in the season-seven episode "Class of '56". Sgt. Alvinia T. Plout (Vicki Lawrence) is a tough-as-nails drill sergeant Laverne and Shirley met when they went into the Army. Officer Norman Hughes (Bo Kaprall) is a police officer and love interest for Laverne. Mr. Hildebrand (Norman Bartold) is Laverne and Shirley's boss at Bardwell's Department Store. Laverne & Shirley premiered in the 1975–76 TV season, with its first episode airing in January 1976. By its third season, it had become the most-watched American television program. In August 1979, before the start of its fifth season, Laverne & Shirley was moved to Thursdays at 8 pm opposite The Waltons on CBS and Buck Rogers in the 25th Century on NBC. Viewership fell sharply. In an effort to improve the show's ratings, ABC moved Laverne & Shirley to Mondays at 8 pm in December 1979. The ratings fared no better so, in February 1980, the network moved the series back to its familiar Tuesday-night berth right after Happy Days, where it remained for the next three years. By the end of the fifth season, however, the sitcom failed to make the list of the top 30 programs. Between 1980 and 1982, the ratings improved considerably, but despite having regained its Tuesday-night time slot and changing its format, Laverne & Shirley never regained the popularity it had attained during its first four years on the air. By the time of its cancellation in 1983, it had ranked at number 25 for the season. During the run of the main show, an animated spin-off called Laverne & Shirley in the Army began airing on Saturday mornings. The first program was aired on October 10, 1981, and featured the voices of Marshall and Williams playing Laverne and Shirley in the Army with a talking piglet drill sergeant named "Squealy" (voiced by Ron Palillo). The show was renamed Laverne & Shirley with Special Guest Star The Fonz when the Fonz began working in the motorpool as the chief mechanic, and then again renamed Mork & Mindy/Laverne & Shirley/Fonz Hour when new segments involving a teenaged Mork & Mindy were added to the mix. The series ran until September 3, 1983. The program was so successful at the time that it spawned a merchandise franchise. Mego released two models of Laverne and Shirley dolls, and one model of Lenny and Squiggy dolls. Hot Wheels created a Shotz Brewery delivery van, and several novelty toys were sold such as Halloween costumes, a board game, jigsaw puzzles, coloring books, video slot machine and other toys. Paramount Home Entertainment and (starting with season 2) CBS DVD have released the entire series of Laverne and Shirley on DVD in Region 1, albeit with music substitutions and scene deletions. On June 16, 2015, CBS DVD released Laverne & Shirley – The Complete Series on DVD in Region 1. Season 1 has also been released on DVD in Region 2. The first three seasons have been released on DVD in Region 4 by Paramount. The theme song from the series ("Making Our Dreams Come True" as performed by Cyndi Grecco) was released as a single from Cyndi's LP by the same name and became a radio favorite, becoming a top-30 American hit in 1976. 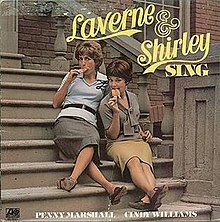 In 1976, Penny Marshall and Cindy Williams released an album, performed in character, titled Laverne & Shirley Sing, which contained some original songs along with some 1950s and 1960s standards. The album was originally released on Atlantic Records. On November 11, 2003, Collector's Choice released it on CD. 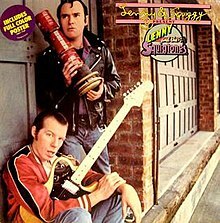 In 1979, Michael McKean and David Lander followed suit with the album Lenny and the Squigtones, also performed in character, featuring mainly original songs penned by McKean. The album was released on Casablanca Records. In July 1979, McKean and Lander also appeared together (in character) on American Bandstand performing the song "King of the Cars", the single released from their Lenny and the Squigtones album. They also performed "Love Is A Terrible Thing", another song from the album. In 1980, Romina Power (of Al Bano and Romina Power fame) recorded a separate theme tune for the show when it was introduced to the Italian market. 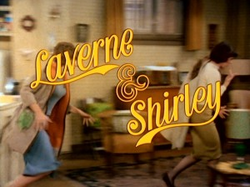 The track, simply titled "Laverne & Shirley" featured verses in English and Italian. Released as a single in the same year, the track failed to chart. ^ "MARK ROTHMAN". Archive of American Television. Retrieved 1 November 2017. ^ SHER, LAUREN. "'Laverne & Shirley' Reunion: 5 Fun Facts From the Cast". ABC News. Retrieved 24 April 2017. ^ "LAVERNE & SHIRLEY". Archive of American Television. Retrieved 24 April 2017. ^ B. Myint (January 27, 2016). "7 Facts About 'Laverne and Shirley'". Biography.com. Retrieved March 7, 2018. ^ "Laverne & Shirley - Awards". IMDb. Retrieved March 7, 2018. ^ "'Laverne & Shirley' Reunion: 5 Fun Facts From the Cast". Retrieved November 4, 2015. ^ a b YouTube video: "Squiggy on Marijuana." ^ Ree Hines. "Cindy Williams on why she left 'Laverne' in 'Shirley, I Jest'". TODAY.com. Retrieved March 1, 2016. ^ "The Story of Laverne's "L"". www.childrensmuseum.org. The Children's Museum of Indianapolis. Retrieved 15 May 2017. ^ "CINDY WILLIAMS". Archive of American Television. Retrieved 9 October 2017. ^ "Laverne & Shirley DVD news: Announcement for Laverne & Shirley - The Complete 8th and Final Season - TVShowsOnDVD.com". Archived from the original on April 27, 2015. Retrieved April 20, 2015. ^ "Laverne & Shirley DVD news: Announcement for Laverne & Shirley - The Complete Series - TVShowsOnDVD.com". Archived from the original on April 26, 2015. Retrieved April 20, 2015. ^ "Kiss Related Recordings; Peter Criss (as Ming The Merciless) : Lenny and Squiggy - Lenny and the Squigtones1979". Retrieved April 20, 2015. ^ "Casablanca Album Discography, Part 3 (NBLP 7100-7199)". Retrieved April 20, 2015. ^ Romina Power - Laverne & Shirley (1980). YouTube. March 4, 2011. Retrieved April 20, 2015. This page was last edited on 17 March 2019, at 00:04 (UTC).